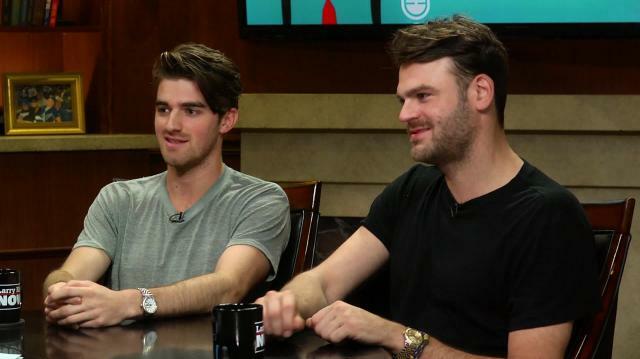 EXCLUSIVE: Electronic/pop duo The Chainsmokers join Larry for their first-ever longform, on-camera interview to discuss their rapid success, new music, performing at Coachella, and their disdain for Donald Trump. “We met after Drew graduated college and I was working in an art gallery and our manager put us together. He was working with us individually and thought we would compliment each other really well. I was more of a DJ and Drew came from more of a producer background. Obviously we didn’t know each other at all and it was like, ‘You guys meet and see if you hit it off and share the same vision.’ The next day he moved to New York and I quit my job and we went full steam ahead.” — Alex Pall on how the Chainsmokers duo came to be. “What we have found is cultivating your creativity is one of the hardest things to do as an artist. And when you have an idea, you have to write it down and if it’s good enough you have to build off of it as quickly as possible before you lose that momentum. So whenever we have an idea for a chord progression or a lyric, we will grab a guitar or piano or whatever then write down the lyric or sing the lyric and every song we have ever written has just progressed naturally from that.” —Drew Taggart on their creative process.